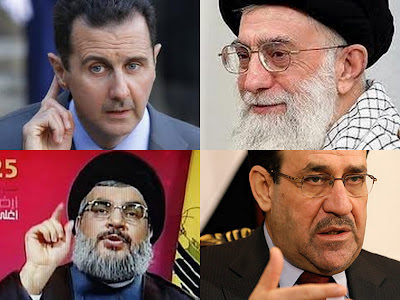 Iraqi Prime Minister Nouri al-Maliki’s plain and explicit support this week of President Bashar al-Assad’s regime in Syria drives a Lebanese political analyst to raise the old specter of a “Shiite crescent” taking shape across the Middle East. King Abdullah of Jordan coined the idiomatic expression late in 2004, when he spoke of a "Shiite crescent" that went from Tehran to Damascus via Baghdad. Eight years on, Shiite powerhouse Iran is flaunting its nuclear ambitions. It has teamed up with Damascus and Baghdad after emerging as the biggest winner of the Iraq war. And it has a strategic cat’s-paw in Lebanese Shiite militia Hezbollah. Iraq’s Maliki on Sunday warned Arab countries against supplying weapons and financial support to the Syrian opposition striving to oust Assad. "We reject any arming of the opposition, we reject attempts to bring down the regime by force, because it will leave a wider crisis in the region,” Maliki told reporters at a press conference In Baghdad. He obliquely attacked Saudi Arabia and Qatar, without naming them, for saying they would extend financial and technical assistance to the Syrian rebels. He spoke as the “Friends of Syria” conferees met in Istanbul to figure how best to support the Syrian opposition. When Muqtada al-Sadr and Maliki break silence to back Assad, when the Bahraini opposition says there is no revolution in Syria, and when Hezbollah turns its back on the Syrian people, the common denominator is obviously sectarian. Bechara recalls that in 2009 Maliki withdrew Iraq’s ambassador from Damascus, saying “ninety percent of terrorists” were infiltrating Iraq through Syria. So what drove him now to toe Iran’s line and join the unholy sectarian alliance? According to Beshara, Maliki -- who is seeking to eradicate Iraq’s Sunnite Baath Party -- has turned into an avid fan of Syria’s Alawite Baath Party. What makes those brought to power in Baghdad on the strength of U.S. Army tanks suddenly oppose international intervention in Syria, if only to protect Saddam Hussein’s clone in Damascus? Bechara says a look at the circumstances surrounding the new crescent’s rise shows its staunchest advocates pulling out all the stops to open an unobstructed route from Tehran to Baghdad to Damascus and on to Beirut. Their aim is to fulfill old Persian expansionist dreams, but in Shiite garb this time. Problem is that by so doing, Shiite Arabs may be boxing above their weight. They risk losing their Arab shine and sense of identity by chasing what is beyond their authenticity and history.